With the 2018 elections ramping up, the public is learning more about local candidates, thanks to the League of Women Voters of Sussex County. 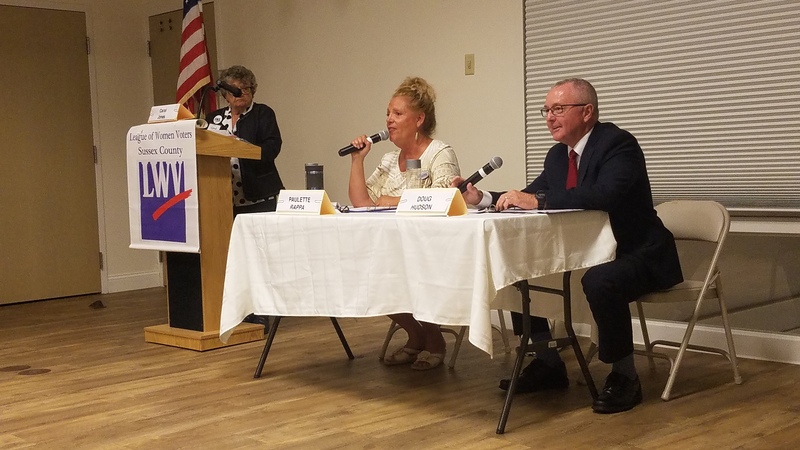 Candidates Doug Hudson of Dagsboro and Paulette Rappa of Long Neck discussed the issues surrounding Sussex County Council District 4 at a LWVSC candidates’ forum on Oct. 9 in Rehoboth Beach. District 4 loosely circles the inland bays on Routes 1, 26 and 24, including Bethany Beach, Ocean View, Millville, parts of Dagsboro and Millsboro, Long Neck, Oak Orchard, Rehoboth Beach and Dewey Beach. Delaware elections will be Tuesday, Nov. 6. “Remember that a democracy is not a spectator sport. See you in November!” moderator and LWV state board member Carol Jones told the audience. Hudson described his experience as a lifetime Delawarean, a state police trooper and a Sussex County Planning & Zoning Commission member during the revision of the County’s Comprehensive Plan. “There’s no doubt Sussex County needs strong voice. … Do you want the same group of people making the same decisions and resulting in the same mess?” Rappa said. As testament to the work she could do for Sussex, she noted that as the director of a nonprofit, she recently won a $500,000 grant for The Way Home’s reentry program. And it’s time for women to serve, Rappa said, emphasizing the lack of diversity on a county council that has only had one woman elected to a council seat in 300 years. “This issue is not about identifying the issues. This election is about identifying solutions,” Rappa said regarding the environment, traffic and solutions that align with the comprehensive plan. What can the county do about the problem of sea-level rise? “The first thing I think county council has to do is acknowledge there is a sea-level rise,” said Rappa, a Long Neck resident. “In about 25 years, if it continues … I will have waterfront property, and I don’t live anywhere close to the water.” She encouraged coordination with the state and federal government, plus researching mitigation strategies from other countries. Both candidates said they support environmental buffers — in particular, as regards the recent debate over increasing mandatory buffers between development and waterways — although Rappa emphasized the environmental need, while Hudson said he wanted a more deliberate process and cautioned against blanket rules for the entire county. How can environmental concerns and property rights be balanced? It’s a delicate balance, said Hudson, adding that he “100 percent” stands behind property rights, but recognizes people must also be good neighbors and stewards of the land. Rappa agreed that property rights are critical, but noted the negative impacts of building too close to environmentally-sensitive areas, which themselves contribute to the local economy. On the subject of the explosion of development around Long Neck, the forum audience asked for solutions to managing traffic, infrastructure and emergency services. Hudson said that P&Z hearings sometimes last for hours as developers conform to county standards. Meanwhile, the Delaware Department of Transportation (DelDOT) manages traffic requirements, so “You can’t just arbitrarily say ‘No’” to building projects, he said. Rappa indicated she was unimpressed with the seeming lack of moderation. Buffer changes were recommended in 2008 but are just now being discussed. There are countless permits in the pipeline, based on older regulations, for which people haven’t yet seen the impact. Her suggested solution was a “hometown overlay,” like a community-based P&Z commission for unincorporated zones, such as Long Neck and Oak Orchard, which otherwise rely on County zoning regulations. It would supersede County zoning and give local communities more power to plan and regulate, she said. Hudson said he didn’t think it feasible for unincorporated communities have separate rules from the County. To control zoning, neighborhoods should instead write a charter and incorporate as a town, he said. The candidates were asked to share the most important changes they feel Sussex County needs. Rappa suggested a more localized planning and zoning process and a public-health advisory committee. “We need to control development, but you can’t stop development. Growth is part of Sussex County,” Hudson said, adding that he also supports expanding the public drinking-water systems. Both discussed options for ensuring that comp-plan recommendations are actually carried through. They also agreed to balance the budget without raising taxes — citing the County’s current comfortable financial position. Neither said they believed in reassessing Sussex County property values, which have not changed since the 1970s. Both candidates agreed that affordable housing is very important. Rappa mentioned the “disconnect” of having more jobs on one side of the county but affordable housing on the other. Hudson said affordable housing was addressed during the comp-plan revision, although it’s tough where eastern Sussex property values are so high and people have individual property rights. “I sometimes struggle with government getting involved with telling someone they have to have a certain piece of land designated for affordable housing,” Hudson said. As for requiring developers to pay more money toward infrastructure improvements, Hudson said they do, based on State requirements for road improvements, but he said he wasn’t sure the County can arbitrarily demand more fees, but must justify any increases. However, Rappa said that with the explosive growth, developers are not paying to the extent they can. They also touched on the water contamination in privately-owned wells around Millsboro. Both agreed that Sussex County, or the private water suppliers, need to expand water districts, just as Sussex County is doing with public sewer. They also pointed to the lack of disclosure of well contamination during real estate transactions. Both agreed that Sussex County needs to spotlight public health, but not necessarily by having a formal health department. “The State does a really good job with the health department. I think that we could help them expand and work with them a little better,” said Hudson, adding that Sussex is attractive for its low tax rate, which he said would disappear with more services. Rappa suggested that Sussex County form an advisory committee for public health and then research similar models in other towns and counties. She also pointed to the seemingly high cancer rate in the Millsboro area. How can County Council attract new companies and increase economic development? Rappa said that manufacturing is being replaced by technology- and service-based jobs, so the county needs an educated workforce to attract those businesses. Sussex should evaluate the local needs, including medicine, an aging population and agriculture, she said. Hudson disagreed, saying he believes that manufacturing will make a comeback, so Sussex has to be economical for those businesses. Sussex can entice those industries with high-speed internet, railroads and industrial parks, he said. Both agreed with the idea of having master-planned areas. But they hesitated around the idea of mandating that developers build neighborhood roads to DelDOT standards. Prices would be higher for buyers in such communities, Hudson said, although Rappa noted that the cost of repairing substandard roads would be higher later. Upon hearing that Ocean City, Md., has invested in solar power, Hudson said alternative power is great but should be managed by a private entity, while Rappa said she would consider exploring clean power to save money.